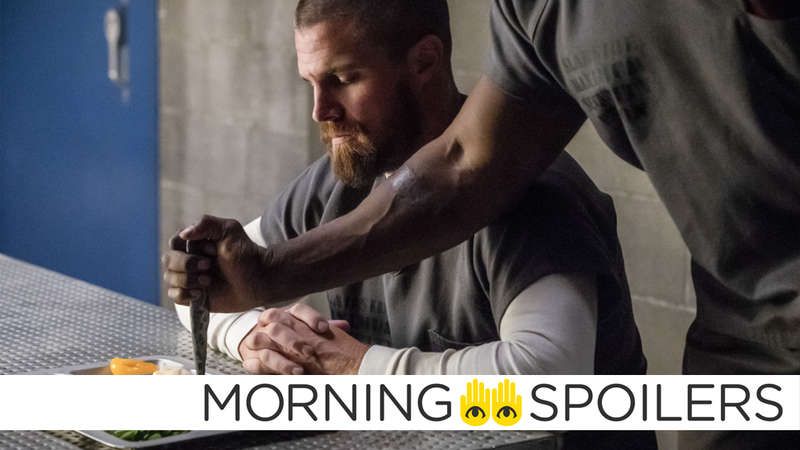 Ollie’s gonna have to contend with more than just someone shanking his prison dinner in season 7. There are more rumors about who could appear in The Mandalorian. Get a closer look at Mary Poppins Returns’ animated sequences. The midnight club convenes in new Riverdale pictures. Plus, what’s to come on Doctor Who, a new clip from Ralph Breaks the Internet, and a look at Jason Todd in action on Titans. Spoilers, away! Speaking with Coming Soon, Common revealed he will not return as Cassian in John Wick: Chapter 3. I’m not in the third part, but I could say that I really loved being a part of John Wick 2 and it was an amazing experience. Working with Keanu and Chad, they’re just phenomenal. Challenged and really passionate about the stuff, and I can say that three is going to be incredible, though, I’ll tell you that much. A leaked document from Vertical Entertainment claims Aquaman runs 143 minutes. The Spiders of multiple worlds assemble on a new banner from Coming Soon. Transformers News has the latest international poster. The film’s official Twitter has added five new character posters. Entertainment Weekly has seven new images from the Mary Poppins sequel, taking a look at the film’s take on the original’s dazzling mix of 2D animation and live action. Head over there to see the rest. Gal Gadot makes chase in a new clip. In related news, the eleventh episode of season seven is titled “Past Sins,” according to Beth Schwartz on Twitter. The latest episode of the Making Star Wars podcast reports Carl Weathers is rumored to guest-star on The Mandalorian as an undisclosed supporting character. Unexpectedly, a two-part animated Jurassic World Lego special is set to air November 29 on NBC. TV Line has a new poster for season two. When Hank Heywood (guest star Tom Wilson) confronts Ava (Jes Macallan) about the spending habits of the Legends, Nate (Nick Zano) steps in to try and smooth things over by inviting Hank on to the Waverider. The Legends then show Hank what they do by visiting 1920s Paris, trying to capture the newest Fugitive. Meanwhile, Mona (Ramona Young) is trying to make a good impression with Ava, but her over eagerness gets her and Ava stuck in a cell instead. Caity Lotz, Matt Ryan, Brandon Routh, Dominic Purcell, Tala Ashe and Maisie Richardson-Sellers also star. Dean Choe directed the episode written by Phil Klemmer & Matthew Maala wrote the episode (#406). Original airdate 11/26/2018. Sam (Jared Padalecki) and Castiel (Misha Collins) track down a Shaman (guest star Dimitri Vantis), who may be able to help a friend. Nick (Mark Pellegrino) continues to spiral down a dark path as he looks for answers surrounding the deaths of his wife and son. Jack (Alexander Calvert) turns to Dean (Jensen Ackles) for help enjoying the human experience. John Showalter directed the episode written by Eugenie Ross-Leming & Brad Buckner (#1407). Original airdate 11/29/2018. After some unusual seismic activity, Harry (Rupert Evans) informs the sisters that Hilltowne is a portal to hell. With that said, the sisters must band together to fight off a shadowy demon that is trying to obtain a collection of powerful magical artifacts. Meanwhile, Macy (Madeleine Mantock) is given an exciting opportunity at work which comes with unexpected complications. Lastly, Maggie (Sarah Jeffery) has a conflict of conscience over her relationship with Parker (Nick Hargrove). Melonie Diaz also stars. Jamie Travis directed the episode written by Sarah Goldfinger (#107). Original airdate 11/25/2018. Betty interrogates The Midnight Club in photos from the November 28 episode, “Manhunter.” Head over to KSiteTV for more. Jason Todd debuts in the trailer for this week’s episode of Titans. The TARDIS crew meet King James the first and become embroiled in a witch hunt in the synopsis for “The Witchfinders,” the eighth episode of season eleven. The Doctor, Ryan, Graham and Yaz arrive in 17th century Lancashire and become embroiled in a witch trial, run by the local landowner. As fear stalks the land, the arrival of King James I only serves to intensify the witch hunt. But is there something even more dangerous at work? And can the Doctor and her friends keep the people of Bilehurst Cragg safe from all of the forces amassing in the land?